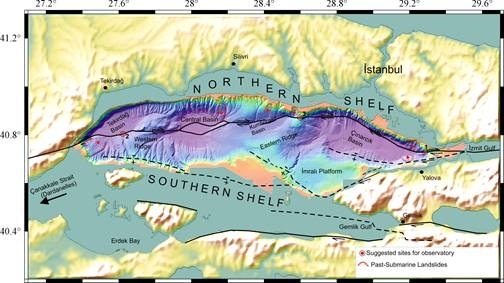 Marmara sea is one of the most active and hazardous fault in the European area. Thus it is a site of investigation for seismogenic studies. It has revealed special habitats on associated seeps. The overall objectives of the proposed activity in the Marmara region are mainly focused to conduct comparative studies of multiple, interrelated processes driven by fault movement. These studies should be carried out giving high priority to those areas which are more prone to seismic hazard. The lack of extensive, more-or-less continuous time-series measurements is probably one of the most serious limits to understanding of long-term trends and cyclic changes of fault behaviour, as well as episodic events such as major earthquakes or submarine landslides. The key point to address these issues will be obtaining time-series observations at different locations along the North Anatolian fault system. The results of these observations could be integrated in theoretical models that will be used to predict fault behaviour and to guide new experiments.